This dress is a great example of the Basque waistline. 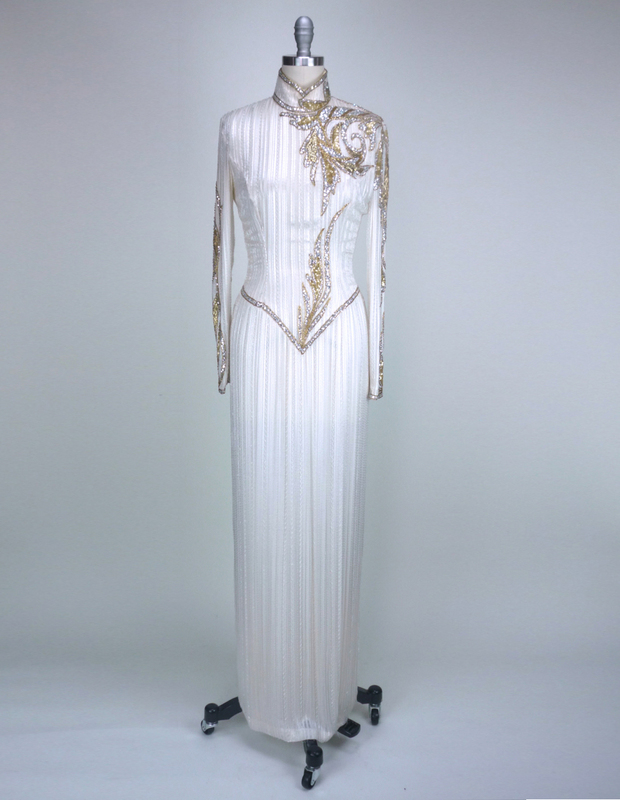 The seaming in the bust is Princess, building up to a lovely high, or Mandarin neckline, and in true 80s fashion, heavily beaded over the entire dress with clear bugle beads, accenting the subtle texture variation in the silk, while gold sequins add additional colour and texture! The dress falls straight, to the traditional Formal length. Try metallic stilettos for high drama, or play it down a bit by wearing metallic ballet flats, or sandals. Previous PostTuesday : NITE Line Della RoufogaliNext PostWhat is Vintage?